The Bomber Fat Free Shad, Fingerling, Guppy and Fry series crankbaits have proven themselves in today’s market of crankbaits with a Bassmaster Classic victory and over 1 million dollars in prize money. 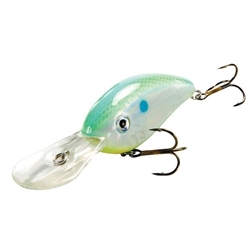 When introduced, this flat-sided deep-runner completely renovated the crankbait market. With an enticing tight action, the Fat Free Shad is responsive with an ease of retrieve never before seen in a bait of its size and running depth. Add the latest advances in color and reflectivity, realistic 3D eyes and Xcalibur Tx treble hooks and you have the premier deep-diving crankbait on the market.